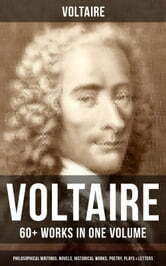 Musaicum Books presents to you this carefully created collection of Voltaire's philosophical writings, novels, historical works, poetry, plays & letters. This ebook has been designed and formatted to the highest digital standards and adjusted for readability on all devices. François-Marie Arouet (1694-1778), known by his nom de plume Voltaire, was a French Enlightenment writer, historian, and philosopher famous for his wit, his attacks on the established Catholic Church, and his advocacy of freedom of religion, freedom of expression, and separation of church and state. Table of Contents: Novels Candide Zadig Micromegas The Huron The White Bull The Man of Forty Crowns The Princess of Babylon The Sage and the Atheist Stories Memnon the Philosopher The Black and the White The World as it Goes Andre des Touches at Siam Bababec Jeannot and Colin The Travels of Scarmentado A Conversation with a Chinese Plato's Dream Pleasure in Having no Pleasure An Adventure in India The Good Brahmin The Two Comforters Ancient Faith and Fable The Study of Nature Dialogues Plays Mahomet Merope Olympia The Orphan of China Brutus Amelia Oedipus Mariamne Socrates Zaire Caesar The Prodigal Alzire Orestes Semiramis Catilina Pandora The Scotch Woman Nanine The Prude The Tatler Poems Henriade (Canto IX) The Lisbon Earthquake and Other Poems Philosophical Works A Philosophical Dictionary Letters on England Treatise on Tolerance Historical Works Age of Louis XIV The History of Peter the Great, Emperor of Russia Letters Letters to Jonathan Swift Letter from Voltaire to Charles Jean-Baptiste Fleuriau Literary Criticism Voltaire and England by Lytton Strachey Voltaire's Tragedies by Lytton Strachey Voltaire and Frederick the Great by Lytton Strachey Lectures on Voltaire by Robert Green Ingersoll Biographies Voltaire: A Sketch of His Life and Works by G. W. Foote and J. M.